2016 was a fantastic year for the New Zealand Organisation for Quality. The year started with the planning of hosting the Asia Pacific Quality Conference in Rotorua in November 2016 and involved months of hard work and planning by the Board and Conference Committee to make this event a grant success. The year also saw us join forces with New Zealand Business Excellence Foundation (NZBEF) to provide a one-stop shop in the country for Quality Assurance, Business Excellence and Baldrige. NZOQ now have an Auckland presence with the opening of our Northern hub with NZBEF at Level 3, 81 Grafton Road, Auckland, as well as our existing National Office in Palmerston North. 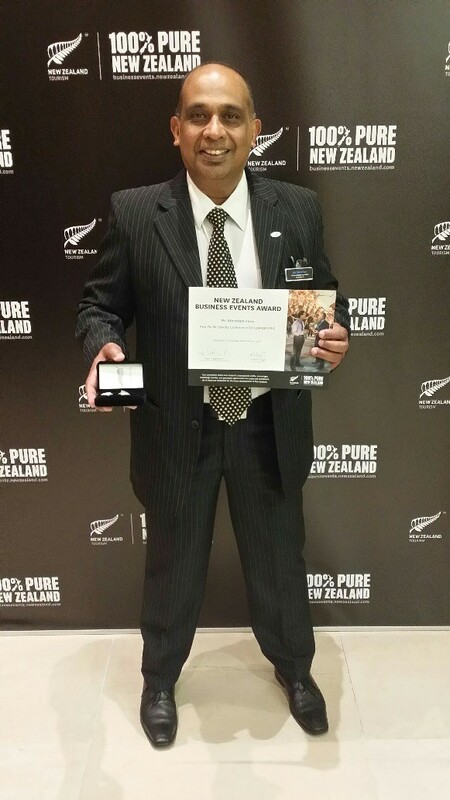 Abraham was awarded the Tourism New Zealand Excellence Award for organising our APQO Conference 2016, which was a grand success for NZOQ with over 385 delegates from over 25 countries attending the conference making it the largest Quality conference ever held in this country. It was an ideal opportunity for our members and all New Zealanders to mingle and mix with like-minded professionals over the two-and-a-half days and also to listen and learn from some of the well known quality gurus from all over the world. The feedback from the attendees have been absolutely positive and we have clearly used this opportunity to put New Zealand on the ‘World Quality map’! New Zealand Organisation for Quality has now moved up from a Core Council Member to one of five Sustaining Council Members of the Asia Pacific Quality Organisation (APQO). Abraham was elected as President-elect of APQO at the Core Council Meeting in Rotorua in November 2016 and he continues on as Vice-President of International Conferences at APQO. Let us continue on building NZOQ in the coming years! NZOQ is the association for quality improvement and practice in New Zealand. Australasia’s leading source of information on Quality Management and Business Excellence.